This post will cover the essential mathematics for doing 3D graphics programming. I chose to split it out into a separate post because there is quite a lot of ground to cover, and attempting to wedge all of these concepts into a tutorial post would be overwhelming. If you already have a grasp of this material, this post is largely optional, but it does establish the notational and geometric conventions I use elsewhere. This is a living document, and I will be expanding the material substantially over the next couple of months. In particular, I’ll try to include more examples and additional illustrations. In order to make the move to three-dimensional space, we need to introduce a few new mathematical concepts. We need to know how to represent points in 3D space, how to move points between different coordinate frames, and how to remove the third dimension when projecting points onto the screen. The Cartesian plane has two perpendicular axes (commonly labeled and ). When we want to speak of things that are perpendicular, we’ll call them orthogonal. Points are identified by specifying their extent along each axis. For example, the point is 3 units to the right along the x axis and 5 units up along the y axis, relative to the origin. The origin is identified as the point having coordinates (0, 0). We turn the Cartesian plane into a 3D coordinate space by adding another orthogonal axis, which we’ll name . Handedness refers to the orientation of the z-axis in a given 3D space. If the z-axis conforms to the so-called right-hand rule, , then the space is said to be right-handed. Alternatively, if the z-axis points in the other direction, , the space is left-handed. The term “handedness” comes from a mnemonic for remembering which way the third axis points. Identify your thumb as the x axis and your pointer finger as the y axis. Hold up either hand and make an ‘L’ with these two fingers. Now, when you extend your middle finger perpendicular to both of the other fingers, it indicates the direction of the positive z axis: the middle finger of your right hand will point toward you, and the middle finger of your left hand will point away. The choice is arbitrary, but I choose to work in right-handed spaces when possible. However, we will give Metal our vertices in a 3D space called clip space, which is left-handed. As long as we make the switch from right- to left-handed at the correct place in the rendering process, everything works out okay. A geometric transformation is a function that maps a point to another point. The most common transformations in computer graphics are translation, rotation, and scaling. In three dimensions, rotation and scaling can be represented as a multiplication of a 3×3 matrix by a 3D point. Unfortunately, translation cannot be represented in this way, but there is a formulation we’ll see below that nevertheless allows us to capture all the transformations we wish to perform using matrix multiplication. First, we’ll consider the family of transformations known as linear transformations. In words, the first condition means that scaling the input before the transformation is the same as scaling the output after the transformation. The second condition means that the transformation of sums is equal to the sum of the transformed inputs. , , and are the scale factors along the x, y, and z axes, respectively. You can see that if , the matrix is the identity matrix. Rotation in three dimensions is a complex topic. Fortunately, we don’t need to understand all the intricacies to use them. First, we consider rotation around the Z axis, then generalize to rotation around any axis. It is important to note that is in radians, and a positive angle results in a counterclockwise rotation. Matrices that represent rotation around the X or Y axis can also be formulated, and look very similar. Once again, is in radians, and a positive angle results in counterclockwise rotation when the axis is pointing at you. Shear is a somewhat less commonly used transformation that moves points parallel to an axis. Shearing terms arise in the off-diagonal elements of matrices. If you work through some examples, it will become obvious that rotation, scaling, and shear are all linear transformations, but translation is not. The fact that a transformation is linear is what allows us to write it as a matrix. The last transformation we will encounter is a translation, which moves points along a vector in space. One straightforward way to implement this is with vector addition, where we map from one point to another by adding a vector. Consider the formula below, where is a point and is the vector we wish to translate by. It is impossible to build a 3×3 matrix that can be multiplied with a point to produce the translation above. However, we can use a handy trick in the fourth dimension to handle all of our transformations in a unified way, starting with translations. We aren’t violating the assertion that translation is not a linear transformation in 3D here. The matrix above represents a type of linear transformation called shear. Again, it’s crucial to realize that the above matrix does not represent translation of a 4D point, which would not be a linear transformation. We’re exploiting a characteristic of linear transformations in 4D space that correspond to translations once we drop back into 3D. The type of transformation we built above has a name: it is an affine transformation. An affine transformation is a linear transformation composed with a translation. Perhaps you noticed that the upper 3×3 matrix in the translation matrix was the identity matrix. 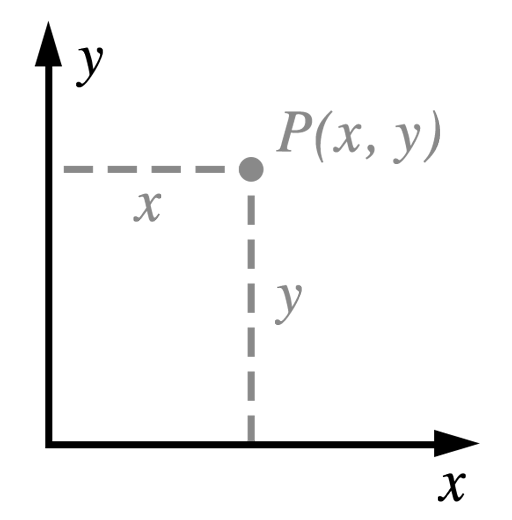 Above, is a 3×3 linear transformation, such as a rotation. is the 3×1 column vector containing the translation, and is the 1×3 row vector containing all zeroes. As before, this matrix will be applied with a vector on the right, and therefore the transformations will be applied right-to-left. So, if we had a sequence of transformations to apply scaling ( ), rotation ( ), and translation ( ) to an object, in that order, we would compose the transformation as . This transformation first scales the object, then rotates it, then positions it in space, with each transformation occurring relative to the origin of the previous transform’s local coordinate space. Since our ultimate aim when programming 3D graphics is to produce a 2D picture, we need a way to squash the third dimension down while creating the illusion of perspective. This is achieved through the use of a perspective projection transformation. The projection transform is applied in the vertex shader. You can think of the portion of the world that is visible through a virtual camera as a pyramid with the top chopped off. This shape is called a frustum. By choosing an aspect ratio (the ratio between the width and height of the viewport) and a field of view, we implicitly determine the clipping planes that make up the sides of the view frustum. The pyramidal shape of the frustum is a natural outcome of our demand for perspective. The perspective projection scales points relative to their distance from the virtual camera, which in turn causes the sloped sides of the view frustum to become parallel as it undergoes this transformation. Points far away are squeezed closer to the axis of view, which causes the phenomenon of foreshortening, an important depth cue. We need to make sure that the points produced by our projection transform are in the coordinate space it expects. Everything that is to be visible on the screen must be scaled down into a box that ranges from -1 to 1 in x, -1 to 1 in y, and 0 to 1 in z. This coordinate system is called clip space, and it’s where the hardware determines if triangles are completely visible, partially visible, or completely invisible. The edges of triangles that are partially visible are clipped against the planes of clip space. This clipping process may turn a triangle into a polygon, which is then re-triangulated to produce the geometry that gets fed to the fragment shader. 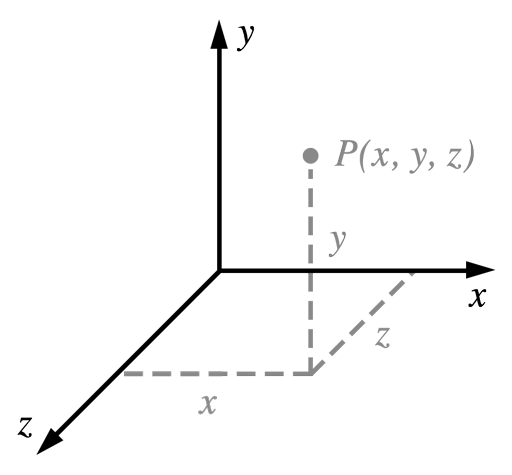 In this matrix, , , , and refer to the clipping plane offsets illustrated in the figure of the view frustum: right, top, near, and far planes, respectively. The construction of this matrix is beyond the scope of this article, but you can view a very well-illustrated derivation at Song Ho Ahn’s site. Note that OpenGL uses a different clip-space than Metal: OpenGL’s z axis runs from -1 to 1, rather than 0 to 1. This accounts for the slightly different form of the above matrix, as compared to the matrix derived in the reference. With iOS 8 and OS X Yosemite, Apple introduced a library called simd that implements SIMD (single-instruction, multiple-data) arithmetic for scalars, vectors, and matrices. This library provides exactly the same types and operations that the Metal shading language does, which means that there’s an opportunity for reuse between your Objective-C code and Metal shaders. I use SIMD types and operations whenever possible. For more information, view the WWDC 2014 session, What’s New in the Accelerate Framework. There are two options when storing two-dimensional matrices in memory: row-major and column-major. With row-major storage, the rows of the matrix are written contiguously to memory, while with column-major storage, the columns are written contiguously. Because the SIMD library adopts column-major storage, I will do so as well. When working with matrices in shader code, you can use the more compact syntax matrix, but note that the subscript order is still column, row rather than the more typical row, column as you’d expect in C.
Perhaps an interactive .playground where users could play with the effects of vectors and matrices would be helpful? Ash, I couldn’t agree more. I definitely hope to flesh out this content much further in the future. My original intent with this site was to write content that would help intermediate graphics programmers move to Metal. I’ve found myself writing a lot of supporting material in an effort to give context to the discussion of Metal’s feature set. But you’re completely right; the math doesn’t deserve short shrift. You are an exceptional teacher of Metal keep it up! Looks pretty straightforward. I assume you’re using pre-baked lighting textures for the Cornell box, and using a third-party physics library? For manipulating the cubes, you presumably use picking (with a ray cast into the scene) and create a short-lived spring system to generate the drag effect. Are you planning to implement real-time shadows? And implementing Apple’s SKActions with transformations seems some to me. For example: move to destination in 3.0 seconds, dissolve, etc. By the way…why doesn’t the latest iPod touch 5 Generation support Metal? I haven’t event been able to run Metal on a real device yet….but I will soon with a new iPad. Cheers! The latest iPod touch doesn’t support Metal because it still has an A5 processor, which is downright ancient compared to last year’s A8 processor. As for Simulator support, yeah, that’s disappointing. Seems like it wouldn’t be too terribly difficult, but it wasn’t enough of a priority for the initial release. Despite the inconvenience, though, GPU performance in the Simulator is radically different from the onboard GPU, which makes on-device testing paramount. How do you think Metal does compare with SceneKit for small development teams who don;t want to use Unity but are tempted to build their own engines? There’s some pretty amazing technology there? Writing a renderer, much less an engine, is a major undertaking. I think a small team would be foolish to reinvent the wheel when Unity is so incredibly powerful and comes with support for multiple platforms out of the box. If your game is a commercial venture and not merely a hobby, why reinvent the wheel and simultaneously lock yourself into a set of devices that only comprise 50% of the total number of iOS devices in the wild? Of course developing with SceneKit is faster than with Metal. SceneKit is expressly designed to be a high-level abstraction layer. It has the same type of limitation as other abstraction layers: when you try to scale it and you hit the wall, you have nowhere to go except down the abstraction stack. I suppose it’s possible, but given how OpenGL-centric it is (e.g., custom drawing and shading are done with gl functions and GLSL shaders), it would require some changes to make it sufficiently API-agnostic or add Metal as a supported implementation target. I can’t wait for your book to unlock the secrets of future device in 3D. Let’s have a beer in SF & talk about taking over the world n 3D. Thanks for the note, Alex, and sorry it took me so long to reply. You’re absolutely correct. I’ve fixed the matrix above and hope to update the sample code that uses the incorrect projection math before long.